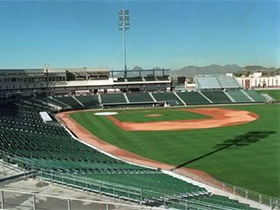 Originaly the spring training facility for the Arizona Diamondbacks and Chicago White Sox. Wilson Electric provided a complete Pro Sound and structured cabling installation at this multi-purpose facility. Wilson Electric was part of the Design Assist team, approximately 60 contractors and subcontractors. Construction began in 1995 and was completed for opening day March 31, 1998. 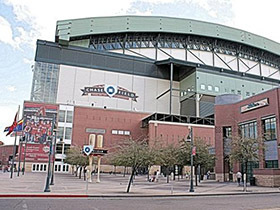 The 1.3 million square foot stadium is six levels with 49,000 seats, 69 luxury suites, six party boxes and a swimming pool on 26 acres in downtown Phoenix. The 5.25 acre retractable roof is made of 9 million pounds of structural steel, and opens using two 200-horsepowered motors and four miles of cable on a pulley system. NETSIAN Technologies Group integrated all special systems including closed circuit television, access control and fire alarm. Energy-efficient controls for the retractable roof and HVAC DDC temperature controls were installed, as well as Avaya structured cabling infrastructure and ProSound Audio-Visual System. Wilson Electric's Service Division has provided preventative maintenance for the facility ever since. 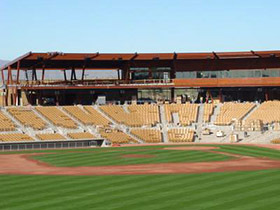 The Camelback Ranch Spring Training Facility is home to both the Los Angeles Dodgers and the Chicago White Sox. Across 151 acres, the massive facility has 14 practice fields in addition to the main field and two 60,000 SF clubhouses, one for each team. Wilson Electric provided electrical design assistance, installation and distribution including LED site lighting, MUSCO specialty lighting and signage. NETSIAN Technologies Group was responsible for audio-visual design, installation and programming, and fiber optic cabling throughout the facility. Westworld, Scottsdale's famed Equestrian Center, is expanding their facilities to include a 150,000 square foot enclosed, climate-controlled arena for equestrian shows and other special events. 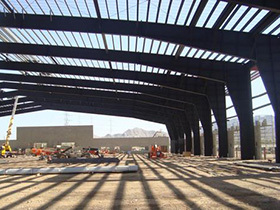 Expected to be complete by October 2013, the expanded equidome will replace the temporary tent structure that is currently home to the Barrett Jackson Collector Car Auctions, one of the Valley’s biggest attractions. We are providing custom lighting fixtures in a controlled lighting system as well as future power capabilities as needed for future shows and events.